Hi from Seattle! That it's raining wouldn't be news, except for the fact it is raining ash, not water. Today the House is expected to pass the first major legislation to speed up the rollout of self-driving cars — an early step to outline standards for artificial intelligence-driven technologies. But, as Axios' David McCabe reports, there's still a long way to go before Silicon Valley and Detroit can fill the roads with driverless cars. 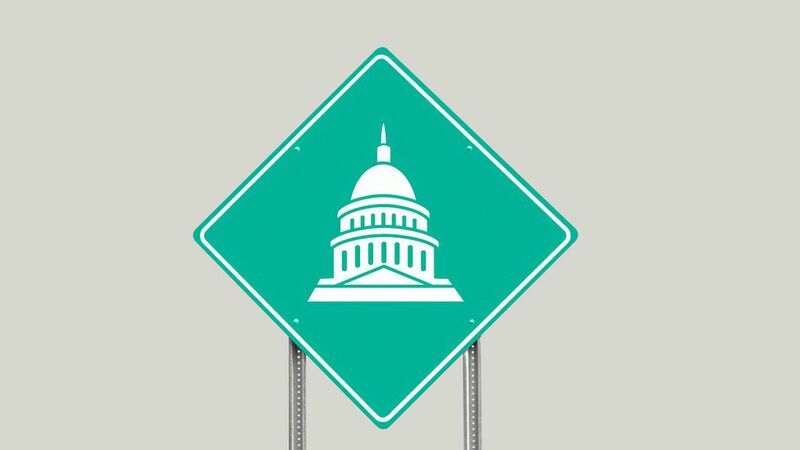 Why it matters: The bill's main provision would let the federal government preempt some state laws when it comes to self-driving cars — eliminating the potential for a patchwork of state regulations that would make it hard for the autonomous vehicle (AV) market to take off. What's next: Transportation secretary Elaine Chao is expected to release revised guidelines for AVs in the coming weeks — a year after the Obama administration published its first policy statement on the issue. The National Highway Traffic Safety Administration will also need to do its own rulemaking to develop specific safety standards for AVs. The top job at that agency, however, is still vacant under the Trump administration. What's in the House bill: In addition to the state law preemption, it would allow manufacturers to get more exemptions to government safety standards to let them test more vehicles. It also would require manufacturers to put in place cybersecurity and privacy protections. What isn't: The bill does not cover autonomous trucks or other commercial vehicles. States would still be allowed to handle driver registration and insurance issues, among other responsibilities, as they do right now. The tech industry had pledged it wasn't going to let President Trump threaten the legal status of hundreds of thousands of immigrants without a fight. On Tuesday, as the president announced plans to end the Deferred Action for Childhood Arrivals policy called DACA, the leaders of some of the country's biggest tech companies promised to take action. "For the 39 Dreamers that we know of who are our employees, our commitment is clear. If Congress fails to act, our company will exercise its legal rights properly to help protect our employees. If the government seeks to deport any one of them, we will provide and pay for their legal counsel. We will also file an amicus brief and explore whether we can directly intervene in any such case. In short, if Dreamers who are our employees are in court, we will be by their side." Stories: But if some of the toughest words came from tech company CEOs, some of the most powerful stories came from the rank and file. "I had my first internship with Salesforce because of DACA," tweeted Salesforce's Kateryn Raymundo, adding the hashtags #heretostay and #IStandWithDreamers. Venture Capitalist Pejman Nozad posted a picture of himself as a young immigrant. "I remember those nights sleeping in an attic! I had dreams, #AmericanDreams. No one can steal it from us! #Dreamers." Apple CEO Tim Cook: "I am deeply dismayed that 800,000 Americans — including more than 250 of our Apple coworkers — may soon find themselves cast out of the only country they've ever called home." Airbnb CEO Brian Chesky and his fellow co-founders: "We founded Airbnb based on the idea that our lives and our world are better when we accept each other. Those aren't just economic or business values. Those are the values America has been and should be all about." Aiming to make its LinkedIn deal pay off, Microsoft is launching a new advertising network based on insights gained from its audience of professional social networkers. The details: The LinkedIn Audience Network, Sara Fischer reports, will let marketers promote ads on sites and apps other than LinkedIn. Previously, advertisers could only reach LinkedIn's audience of professionals on its platform — mainly within its version of a news feed. Now, they can reach them by targeting ads to certain demographics or behavioral groups with data from LinkedIn, wherever they may be on the web. Why it matters: Some of Microsoft's biggest advertising competitors, like Google, Facebook and Twitter, rely on this type of marketing solution to generate large chunks of advertising revenue, particularly on mobile. While LinkedIn isn't as big as Google or Facebook (it has over 500 million members, 25% of which reportedly engage monthly as of last year), the quality of its audience offers a lucrative advertising business. Per Pew, half of online adults with college degrees are on LinkedIn, as well as 45% of online adults with a household income of at least $75,000. More controversial than whether "Frisco" was ever an acceptable nickname for the City by the Bay is the matter of whether gig economy workers should be classified as employees or contractors. The first question Login can answer definitively. Frisco is acceptable only in reference to one city — Frisco, Texas. As for the second, it's beyond our pay grade. What's happening: A federal judge in San Francisco is presiding over a case pitting a former driver for GrubHub against the meal ordering company. A bench trial (aka no jury) began Tuesday and Kia has a full look at the case, including the players and applicable law. Why it matters: This question has yet to be answered despite several high-profile lawsuits against gig economy companies, including Uber and Lyft. And because this one focuses on the plaintiff's experience as a driver for GrubHub, it may not settle the bigger question either. On tap: T-Mobile CEO John Legere is promising to unveil his latest un-carrier move...The House takes up self-driving car legislation (see above). Trading places: Wireless group Mobile Future named former FCC adviser and congressional aide Margaret McCarthy as its new executive director. ICYMI: According to the NYT, the Boston Red Sox used an Apple Watch as part of an elaborate scheme to steal signs from opposing teams. (On the bright side, Apple now has another case study in how businesses can use the Apple Watch. )...Axios' Alison Snyder describes a new survey of executives on the impact of AI...Xiaomi introduced the Mi A1 smartphone which features a metal body, Snapdragon processor, and dual cameras; it's also the Chinese company's first device to feature Android One rather than the company's MiUI interface...Meanwhile, Huawei inked a deal with Microsoft to run Redmond's apps in its cloud, ZDNet says...Per Patch, Dell EMC will pay $110,000 and update its policies to settle discrimination claims from a transgender former employee. Check out this video of opera performers with their singing replaced by the sounds of dial-up modems.